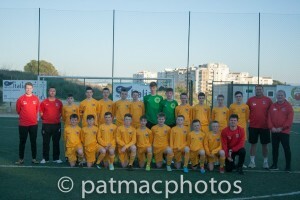 This week we have heard of the success of the KDUL’s Kennedy Cup side’s trip to Portugal. The KDUL Kennedy Cup manager Dave Herd spoke enthusiastically of al involved to make the trip such an accomplishment; resulting in elite preparation for the KDUL sides hopeful success in both the short and long term. “I think we got about two and a half months training in during the week plus a game against a very good Portuguese side. We’d never, ever get that at home,” said Herd. The week culminated with a 2-1 win over a strong local side but Herd was more pleased with the performance of his players in such an environment. Herd had the chance to spend the week on the training pitch alongside coaches Mike Geoghegan, Jamie Smith and assistant manager Eddie Pedley; feeling ‘that they complement each other very well’. The relationship between the coaching staff is intrinsic to success on the pitch, illustrating the preparation involved for KDUL’s finest young players. “The dynamic of the group is very good, we trust each other to do our jobs and we are left alone to do it”, Herd continued. The training methods involved are designed not only to improve the success in the pitch in immediate terms though, but to make better thinkers on the pitch. Indeed, the best players are more akin to coaches who happen to be playing. Herd explains these modern methods. There are now only six months before the Kennedy Cup begins – perhaps the biggest moment in some of these young players’ careers; there will be no chance for the team to rest on their laurels. With the obvious preparation put into these plans it would be of little surprise to success come to the way of the KDUL Kennedy Cup side later this year. For more information keep an eye on the blog here.